What is A Pure Mongol, Anyway? Throughout my research in Inner Asia, various groups of people have commented in asides that the Outer Mongolians, represented by the majority group of Khalk Mongols are “pure” Mongols. This designation, as well as the fact that Buriats and Inner Mongolians distinguish themselves as separate from the Outer Mongolians, requires further explanation. I have chosen to allow the various groups to speak for themselves regarding this subject. First I present the opinions of an educated Han Chinese woman, a professor of English at Inner Mongolia University, concerning the subject of Mongolians and “pure” Mongols. Second, I present, in translation, the comments of an Inner Mongolian mother, whose child attended the research school site. Third, I present in translation the views of a Buriat male, a self-professed historian and nationalist of Buriat culture. Then I present in translation a point of view of a Buriat mother, who has allowed me to observe her child. Finally, I present the comments of two young Outer Mongolians in English, whom I interviewed in Jan 2014, as we sat together in a Mongolian cafeteria eating a typical Mongolian lunch of mutton dumplings and mutton stew. At the end of these narratives, I offer a synopsis and analysis concern pure Mongolians and how Inner Mongolians, Outer Mongolians, and Buriats are different from each other. VS: What are the biggest differences between the Han and the Mongolian peoples today? LL: I think, for Inner Mongolians, there are no big differences; (laughs); Just..uh..we have cultural differences, we have different customs, different traditions, I don’t think we are too different, now...just tradition. VS: Give me an example. Do you think Mongolians follow Confucius? LL: Maybe not...but nowadays Inner Mongolians are greatly influenced by Han culture, are greatly influenced by us (Han Chinese), so there’s no sharp differences between us. VS: What about the Outer Mongolians? LL: Outer Mongolians, quite different. LL: They are traditional, they are pure Mongolians. VS: Everybody says this: pure Mongolians...what do you mean by that, by pure Mongolians? LL: (laughs) Pure Mongolian: I mean they are less influenced by Han people; I think that’s pure Mongolian. VS: When you walk around the campus can you tell who is Outer Mongolian and who is Inner Mongolian? LL: Yes, sometimes, yes, because the Outer Mongols are influenced by Russia, by their makeup, by the way they dress, they look Russian. VS: They look Russian to you? LL: Yeah. Ummm, you know, Inner Mongolian students are like Chinese. They dress more conservative, while Outer Mongolians, well, they, uhh, they can wear very low jeans, their earrings, their long hair, and when they speak their words are different, their appearance is different. VS: So why are they pure? LL: Yes, I think they have no pressure. Life is not so stressful for them...so they are late to everything, they never come to class on time, they never come on time for anything. They live at a very slow pace, they are more comfortable in their life, no pressure. LL: Yes. They are more physical, more wild, you know, well, (Outer Mongolian) boys and girls are together in the night. VS: Can Inner Mongolians do this too? LL: Not really; it was only in the last year or two that Chinese students can get married...before, we had a law, students could not marry...college students can get married now. VS: So what exactly is a pure Mongolian? Are Inner Mongolians pure Mongolians? D: Well, we are all Mongols....but Horchin Mongols, like my family, we are, we are Chinese citizens, and we speak Chinese as well as the Mongolian language. VS: Are Horchins pure Mongolians? D: Because then we served under Genghis Khan long, long ago, we, I guess we used to be pure (laughs). VS: Are there any pure Mongols in China? D: I don’t know....there are many different kinds of Mongolian people here, you know that? D: We are all Mongols, but we are now also Chinese -- I mean part of China....I mean we have Chinese passports. VS: So are the Outer Mongolians pure? D: Because they are free. They are always Mongolian. VS: What is a pure Mongol? BE: Of course, a pure Mongolian is a Mongol who remained in Mongolia, in my opinion those who stayed, they are pure Mongolians. VS: And how do Buriats fit in the picture? VS: You mean Buriats are those that left improperly? BE: Yes. Those that left, in the long past. VS: So who are the Kalmyks? VS: And those Mongolians in China? VS: Ur? What does that mean? BE: It means that they are a type of of those who left long ago for the East..
VS: Are they pure Mongolians? BE: No, no they are not pure. Also they, well, of course, time has passed, and they have mixed blood, so, ..., how to say...they have kept some of their culture. VS: But they are not pure? BE: No, The ones who have really kept their culture are the Mongols (in Outer Mongolia)..
BE: They, the Mongolians themselves kept the culture, but those who left, we the Buriats, the Kalmyk, the Ur Mongols...the Ur, they are closer than we are to the real Mongols, they are closer, but there is a border...they are on Chinese side, and we, there is a border too, we are located closer to the Russians, we are more Russian, this is a fact. 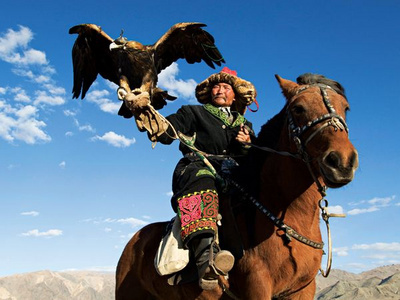 VS: Where is the heart of Mongolian culture? The heart of the pure Mongolian culture? BE: Well, it is Ulan Baatar, or it is the former ancient capital, you know, Karkarum, the old capital, from long ago. VS: But the Inner Mongolians say the Outer Mongolians look and act a little like Russians, what do you think? VS: Then how can they be the “pure” Mongols?If they resemble the Russians. like you (Buriat)? BE: Time passes, civilizations pass and change...they have kept their culture, it is kept. VS: Can you tell me about pure Mongols? AG: But then they closed the border, the Russians did less and less, and the Outer Mongolians, they did everything themselves. VS: Why have they gotten more prosperous after the fall of the USSR? VS: With all this Russian influence, why did you tell me before that they are pure Mongolians? AG: In any case, they are better Mongols than we (Buriats). VS: So language, Mongolian language being prominent, means that they are pure? AG: Yes, and their culture, it’s very important. AG: Despite that, that is society, urban life, but they keep their culture...they speak Mongolian in the city and in the countryside...they have not taken on Chinese or Russian culture, not to any great measure...they keep the Mongolian traditions. That’s how I think. VS: I’m really lucky you speak English, can I ask you one question about Mongolians? Sa: I am pure Mongol (laughs). VS: Why? What is a pure Mongolian? VS: What about the Mongolians in Russia, in China? Sa: Those in China have become Chinese. VS: Some still speak Mongolian..
S: It is important, sure, sure, but they are like Chinese, and the Russian Mongols, they are Russian. VS: Why? I have friends, Buriat Russians, they still speak Buriat and Russian, too. S: Your question is hard to answer. VS: I guess I am asking about being pure, not just about being Mongolian? Sa: Well....I think, maybe, can I say what I think? I think that we are the pure Mongols because we are not under anyone, you can speak Mongol, sure, even a foreigner can speak it, there are a few here in UB that speak some Mongolian, but to be pure, well, it means, it means to remember that you are a part of Genghis Khan, that this was his land, it is our land, and no one can take it, or take us...the others, well, they are not like us, understand? VS: You mean because they live under another government? The narratives presented above suggest that everyone interviewed feels that the Outer Mongolians are indeed “pure” Mongols. Their reasons vary: Mongolians all identify themselves as members of a group that are related, either by blood or by fealty, to Genghis Khan, the great hero of the Mongolian peoples. As one participant suggested, after his death, as the Mongol empire evolved and eventually declined, the Buriats left for the northern lands; other Mongolians went south, and settled in the steppes and grasslands of what is now Inner Mongolia. They did not remain in the heart and homeland of the Mongolian people, so they are excluded from being considered “pure.” Hence, those that left the original homeland are not pure. A second reason that Outer Mongolians are considered “pure” has to do with politics: the Outer Mongolians, despite being governed briefly by the Soviets, did not assimilate and give up their language. Some people did learn Russian, but it was only one generation of Outer Mongolians; all the young Outer Mongolians I met in China and Outer Mongolia spoke Mongolian, and some also spoke English or Chinese as well - as a foreign language. In contrast, the Buriats speak Russian; I have met many Buriats who only spoke Russian, as they had no fluency in Buriat at all. Although the Buriat participants I interviewed never suggested that their people have entirely assimilated to Russian culture, yet many, depicted in these interviews and in other talks, suggested to me that they were indeed, a kind of mixed culture, with Russian culture dominating their daily, contemporary lives as Buriats. In fact, often when I asked a Buriat to tell me who he or she was, the answer would often be: I am a Russian Buriat, as opposed to a Buriat Mongolian or simply a Buriat. A third reason, also political, that OUter Mongolians are considered pure has to do with borders. The Outer Mongolians now have an independent nation, with its own government and national language. Inner Mongolians have language laws and bilingual policies mandated to them by the Han Chinese government, but they are not a free people. The same can be said of the Buriats, who voluntarily realigned with the Russians. in the sense that their living conditions, education, and opportunities had expanded; other times, however, they suggested that they had lost something essential to being Buriat. Their herds and shamans had diminished, their children no longer understood Buriat, or what sacred Buriat words meant. Some Buriat parents quietly told me that they did not want their children to marry outsiders, or to stay in foreign lands. Yet all of the Buriats accepted the fact that the Russians had come into their land and changed their lives, and that they were different from the “pure” Mongolians living in Outer Mongolia. Some even insisted to me that I explain to my university that their situation was not the same as what they had heard about those peoples in the USA: that Buriats did not live on reservations, and hate the Russians for coming to live among them. Rather, several Buriats said to me that they thought of themselves as being good hosts to the Russians, and, as Buddhists, they accepted their fate, and tried to make the best of the situation.